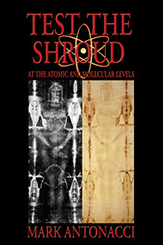 Mark Antonacci makes many prominent arguments in his landmark book, Test the Shroud. His accurate description of all the unique features on the Shroud of Turin allows him to convincingly argue that this is the authentic burial cloth of Jesus Christ. He presents a very testable hypothesis that particle radiation emanating from the dead, crucified body wrapped within this burial cloth caused its unprecedented, full-length body images, its still-red blood marks, its erroneous carbon dating and so many other unforgeable features. He even describes advanced scientific testing techniques that could be applied to this burial cloth, its human bloodstains and Jesus’ reputed burial tomb(s) that could demonstrate whether this unprecedented event actually occurred; when it happened; where it happened; the actual age of the Shroud; and the identity of the victim. You might get some clues about the content of the book from the various articles at Mark’s testtheshroud.org. Certainly there are many exciting archaeological riddles. Recently the British archaeologist Nicholas Reeves believes that beside the tomb of Tutankhamun’s tomb there Nefertiti. Equally interesting is the vexed question of the existence of an alleged “secret room” (see also: Bauval, etc.) inside the Great Pyramid of Giza, etc. But, in my opinion, the scientific investigations on the Holy Shroud of Turin and the Holy Face of Manoppello beat all these archaeological mysteries. should be interested in this research. So …what kind of test? Do you remember the case of my rejected paper (to Dallas), AFM and SSNTD? >British archaeologist Nicholas Reeves believes that beside the tomb of Tutankhamun there is the tomb of Nefertiti. (that He founded), should be interested in this research. Books and papers, including those that are peer-reviewed, as well as petitions, will not make Rome budge. Shroud studies have fallen short of the mark and it will be difficult to get Pope Francis, who can be a tough South American hombre, to agree with new testing. He sat in front of the Shroud and meditated and that is a clear message for “Shroudies”. Pope John Paul II was a bit more positive, however he also spoke about the “mystery of life and death”, which could be expected from a pontiff who was also a philosopher and whose doctoral dissertation was on Scheler. The above post says “Jesus reputed burial tomb(s)” and “whether this unprecedented event actually occurred”. It is evident that just this is sufficient for Rome to ignore the book. Why? Two former Jerusalem District Archaeologists, both of whom are highly respected, have accepted the Church of the Holy Sepulchre as the site of Jesus’ burial, so there are no “tombs”, whatever sensationalists may say. The Israeli authorities are Dr. Amos Kloner and Dr. Dan Bahat, the latter having been invited by the Vatican to lecture at Rome. When things like “whether this unprecedented event actually occurred” are said matters become worse. It will be interpreted as an unconscious lack of faith, as an attempt to “prove” the Resurrection event by hooking it on to a cloth that has yet to be authenticated. The creed does not say “… and was buried wrapped in the Turin Shroud” but it does say “..the third day he rose from the dead”. Lastly, we do not know if radiation had something to do with the image formation. Where are the differences between the image and non-image fibres? If the image is a by-product of Jesus’ resurrection we will never know what sort of power had gone out of the body of Jesus. It would be like asking what sort of power was involved in the instantaneous cure of the woman with the haemorrhage, as described in the Gospel according to Mark. But I think that, willy-nilly, we have to deal with AFM techniques. with the foundations, methods, and implications of science. the ultimate purpose of science. of the methodology and content of the science of chemistry. we can observe in the studies around the Holy Shroud? Then Shroud Science should use that “nanoscale revolution” in order to improve the knowledges… because current science and nano-technologies can solve our problems about analyses on linen fibrils and thin layers on linen fibrils. As you can see I rest in the limit of Popular Science and I have avoided to speak about AFM controls on Ancient Books coming “from the corrupt pre-Flood civilization”, stored in the strange and presumed Secret Archives (at Giza)! The causes of foxing, a rust-red spotting of engravings, books and archive documents, are not yet completely understood, but they are usually ascribed to mould growth and/or heavy-metal-induced degradation of cellulose and sizing materials. In the present work we report the use of attenuated total reflection Fourier transform infrared spectrometry, image analysis and atomic force microscopy as non-destructive tools for the surface analysis of foxing stains in respect of their chemical and physical characteristics. 4500 or 5000 years ago there were no paper books! Was the Great Pyramid just a tomb or does it serve a higher purpose involving a lost “science of immortality”? B.T.W. : Do you believe in the possible existence of the presumed “Ancient Books” in that “Secret Chamber”? Pope John Paul II (Karol Wojtyla) thought deeply. I am sure he did not think that the Pontifical Academy of Sciences would havê to close down if the Shroud was authenticated. The mind was made to think, preferably think twice. Excuse me, but what you really want to say (exactly)? >… Sergio Ferrara and Michael Duff, two of the founders of supergravity, superstring and M-theories, introduce the fascinating subject of supersymmetry, superspace and the superworld; the presentation of the seminal papers by Zichichi and his collaborators is made by two eminent physicists: Rudolf Mössbauer and Sergio Ferrara. ” What is the connection for the past Holy Father (S.t JP II) with AFM controls ? I think all fields of science have failed so far in providing a convincing explanation about how the image may have been formed. I believe that, first of all, we have to admit that it’s impossible to indicate a convincing explanation about the Resurrection because this is a great Mystery of Faith (and, if I am not mistaken, Prof. Giulio Fanti don’t agree on that probable lack of explanation… because he stated that “Science can explain the Resurrection”! Am I wrong in my hasty remark?). Until now, we have not yet shown anything about the exact composition of the thin layers (present on linen fibrils) associated with the color. that is: the final judgment. ie: it is not impossible try to investigate the problem more effectively (ie: using appropriate equipment, etc.). the linen fibrils of the Holy Shroud. Also: using NaClO on treated materials without a gray scale to do the comparison in an unprofessional way to work! A set of AFM three-point bending tests on irradiated (with different levels of exposure) linen fibrils can be useful to start with some useful controls in order to do some new considerations. Is this set of tests too difficult to obtain? I don’t believe… because, in my opinion, also a young team of students can do a preliminar set of controls with an appropriate Lab work! >Another thing: using NaClO on linen treated materials without an useful reference: a gray scale to do the comparison (…without speaking of possible colorimetric measurements on adequate small areas! ), can be an unprofessional way of working. >Also: using NaClO on treated materials without a gray scale to do the comparison in an unprofessional way to work! I prefer the experiments done by Dr. P. Di. Lazzaro. Compared to the experiments done by other scientists, Dr. Lazzaro’s experiments give us some sort of food for thought to imagine how the image on TS was created. Definitely some sort energy dissipated from the dead body of Jesus as resurrected body of Jesus quite different to the body he had before his death.